Lowell, MA J. Calnan & Associates (JC&A), Northstar Project and Real Estate Services, Packard Design and WB Engineers recently completed the global headquarters for Kronos, one of the world’s largest enterprise software companies, generating more than $1 billion in annual revenue with more than 30,000 customers – including half of the Fortune 1000 – using Kronos workforce solutions across more than 100 countries. Kronos recently relocated its headquarters from a three-building campus in Chelmsford – where it called home since 2000 – to its new space, uniting nearly 1,500 Massachusetts-based Kronites under one roof across more than 500,000 s/f. 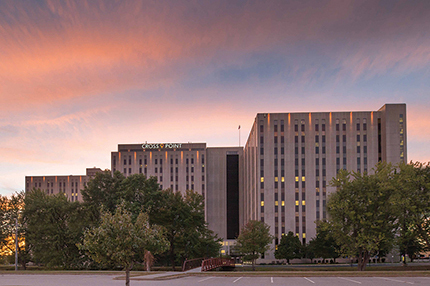 Kronos now occupies 16 floors – including the entire first tower, dubbed the Kronos Tower – in what will total a $68 million renovation of the former home of Wang Laboratories. Working collaboratively with Kronos, JC&A, Northstar, Packard Design and WB Engineers, created a high-performance workplace of the future to inspire collaboration and innovation with hundreds of meeting rooms and open scrum spaces; technology; separate user experience (UX) and hardware labs; a customer community center; and a 30,000 s/f amenities floor called The Hub, featuring a full-service barista, an IT bar for helpdesk support, an indoor park, library, and gaming area – all overlooking an outdoor Kronos-branded sports court. Other key partners for this project included: Anchor Line Partners, Delorey Contract Interiors, Environments at Work/Haworth Inc., and Cushman & Wakefield. “JC&A is tremendously proud to be part of the Kronos story and look forward to watching them flourish in their new home. This truly was a team effort and we’re fortunate to work alongside some of the best partners in the industry,” said Stephen Robak, executive vice president/partner, with JC&A. Vince Devlin, chief procurement officer at Kronos said of the team, “Trust, transparency and a work ethic that put the client first” were the keys to the success of the project.